In a major breakthrough the Telimaura police have recovered at least 35 packets of cannabis worth more than Rs 5 Lakh, according to market price. Acting on a tip off, Teliamura SDPO Tapan Das conducted a sudden drive and seized at least 35 packets of Cannabis from a Bolero car no TR-03F-1569. In another raid, at Panisagar in NH44 under the leadership of SDPO Rajiv Sutradhar seized a huge amount cannabis from a 10 wheeler vehicle NL01G7014 amounting to Rs 70 Lakh. Both the vehicles were carrying cannabis outside the state from Agartala, a source informed. The police have arrested two in connection of drug smuggling. The two are identified as Dipu Kumar, Suraj Kumar. Police is further investigating the case, to arrest the drug peddlers. Drug cartels have transformed tiny Tripura as the new hub of contraband ganja production and smuggling. Enforcement agencies, engaged in preventive operations in the region found a new trend of ganja smuggling from the Northeast. 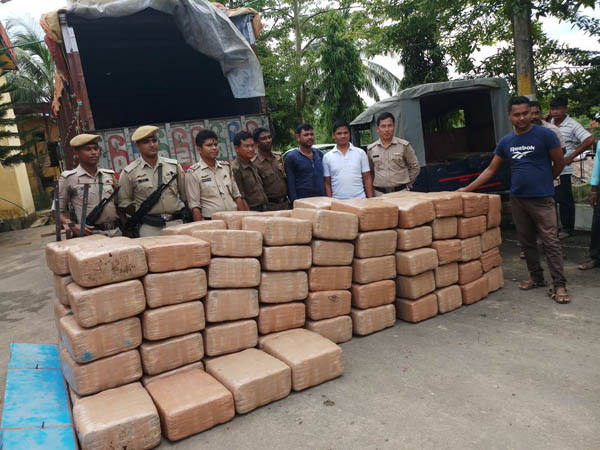 So far, Manipur was the main producer of ganja, and consignments of dried and compressed blocks were regularly being transshipped to Bihar and Uttar Pradesh.